Our customers depend on our expertise and guidance for implementing best practices around the installation and configuration of SharePoint. In some cases, clients would like do as much of the initial setup as they can (prior to us building the Farm) and simply need a few pointers to make sure they ‘get it right’. Hard disk 80 GB for system drive. You must have sufficient space for the base installation and sufficient space for diagnostics such as logging, debugging, creating memory dumps, and so on. For production use, you also need additional free disk space for day-to-day operations. Maintain twice as much free space as you have RAM for production environments. For more information, see Capacity management and sizing for SharePoint Server 2010. Hard disk 80 GB for system driveHard disk space depends on how much content that you have in your deployment. For information about how to estimate the amount of content and other databases for your deployment, see Storage and SQL Server capacity planning and configuration (SharePoint Server 2010). The requirements below represent our recomendations for typical SharePoint 2013 Farms. Please refer to http://technet.microsoft.com/en-us/library/cc262485.aspx for a complete list of requirements for a wider range of farm types. The 64-bit edition of Windows Server 2008 R2 Service Pack 1 (SP1) Standard, Enterprise, or Datacenter or the 64-bit edition of Windows Server 2012 Standard or Datacenter. When using Windows Server 2012 you must manually add .NET 3.5 prior to running the prerequisites installer. Hard disk 120 GB for system driveHard disk space depends on how much content that you have in your deployment. For information about how to estimate the amount of content and other databases for your deployment, see Storage and SQL Server capacity planning and configuration (SharePoint Server 2010). The 64-bit edition of Microsoft SQL Server 2012. Even better, download SharePoint Server 2013 with SP1 already included from MSDN or from the Microsoft Volume License site and skip to step 4. NOTE: This is the required installer if you’re installing on Windows Server 2012 R2. ALSO NOTE: Slipstreaming SP1 into the RTM install source is unsupported; it may seem like it works, but your Farm WILL be broken. If the update is a hotfix, it maybe require a specific hotfix request; otherwise, download the file directly to the C:\SPInstall folder. Hotfixes are delivered as a self-extracting executable file, and you will need to extract the contents to the C:\SPInstall folder. Now, when you install SharePoint Server from this shared location, any service packs and cumulative updates will automatically be installed as well. or the 64-bit edition of Windows Server 2008 R2 Service Pack 1 (SP1) Standard, Enterprise, Data Center, or Web Server. Install SharePoint (specifying I:\SharePointIndex as the default index location). 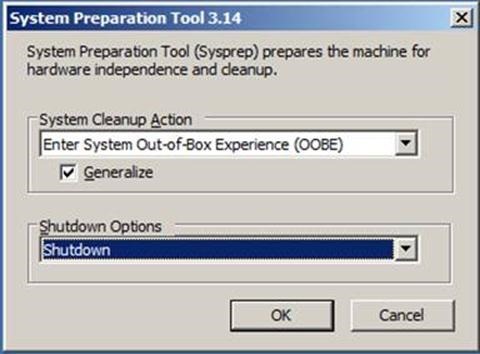 At the end of installation, UNCHECK the box offering to run the configuration wizard. Keeping a copy of the pre-sysprep version of the VM allows for greater flexibility to refresh the ‘template’ VMin the future (e.g. new service packs or updates). That’s the general process to create a base SharePoint VM that can be quickly cloned when you need a new SharePoint server. Once the clone of the sysprep’d VM is booted, the mini-setup portion of a windows install will start, allowing you to specify the machine name, domain membership, etc. The TechNet article at http://technet.microsoft.com/en-us/library/ee662513.aspx describes the accounts required for setup. The setup account is used (logged in as) to install and configure SharePoint (and to run Maestro if using it for Farm creation). We typically name this account SPInstall and use it after install for initial Farm Administration tasks that are not delegated to a specific user. This account will have Full Control over every Farm Setting and though it won’t automatically have permissions in the sites created it will have the ability to grant itself those permissions. This should be considered a HIGHLY privileged account and controlled appropriately. SPInstall will initially be the only account with permission to run commands via PowerShell. You should grant your intended farm administrators this access by running the Add-SPShellAdmin commandlet after installation of the files has completed. We typically name this account SPFarm and though it is used to run services it should never be used to login to any machine or to SharePoint sites as it will have service-level administrative rights to the farm. This should be considered a HIGHLY privileged account and controlled appropriately. NOTE: Maestro can create this account if it is not present in Active Directory. The TechNet article at http://technet.microsoft.com/en-us/library/cc678863.aspx describes the other accounts that are required for running distinct SharePoint services and websites. Maestro can create all of the necessary accounts (as defined in the Composer map) provided the user running Maestro has [credentials for an account with] permissions to create new accounts in Active Directory. If the accounts will be pre-created, we will need to know the passwords for them to either enter into the Composer map or to enter manually during the Maestro run. No roles or features need to be added to the base Windows install as the pre-requisites installation will handle it. Unless we want to do an ‘offline’ installation of the SharePoint pre-requisites (not fun) then all SharePoint servers will need Internet access during installation. All SharePoint servers should be able to access the shared slipstream installation source location on the network. Will service accounts be pre-created or will Maestro be used to create them? Will the three environments share service accounts or will there be a separate set for each environment? Example: SPSearch used for search in QA, UAT, and PROD or separate SPSearch_QA, SPSearch_UAT, SPSearch_PROD. I typically suggest using the same set of accounts across environments as it is less to manage but some organizations have strict policies about this. Where will the service accounts be stored in Active Directory (LDAP path)? Typically, an OU is created specifically for Service Accounts and you might already have one. Windows Server 2008 R2 domains include a container for ‘Managed Service Accounts’ by default and this is a good location.